Do you have rats living in your crawl space or walls? Do you hear noises in your attic at night? Do you notice that your pet’s food disappears during the day? Do you spot dead rats or droppings in your attic? These can be signs of a rat infestation, a problem you will want to solve very quickly. So, watch for the signs and make sure that you know whom to turn to if you face such a problem. 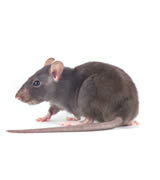 Let Critter Control of Miami provide you with effective rat removal, rodent cleanup, and exclusion services. What is a roof rat and how do you spot one? A roof rat is usually a large rodent that is approximately seven inches long with a tail usually longer than the head and body combined. These creatures are either brown or black with a gray or light colored belly. They have naked ears and long, course fur. Many experts consider these critters the most serious pest mammal. They can wreak havoc on stored grain, spread disease and damage structures. They typically build a habitat where there is grain, seeds, fruit, or garbage, so they are likely to live where humans live. While these pests can be found throughout all regions of the United States, they are more commonly discovered living in Southern states. If they are not removed, then they are likely to cause ongoing damage to a structure. Once a problem is discovered, you should take a few precautions before a roof rat specialist arrives. First, do not take safety lightly. These rodents are known for transmitting serious diseases and carrying a variety of parasites. They are dangerous to both humans and pets. People can be exposed to plague and typhus fever. Do not attempt to get rid of these animals on your own. Contact a roof rat professional who will provide removal and roof rat prevention services. You can contact us at Critter Control to learn more about what to expect before the technician arrives. The professional will provide roof rat trapping and removal, roof rat damage repair, and prevention services.